Wonder what to look out for in 2019? 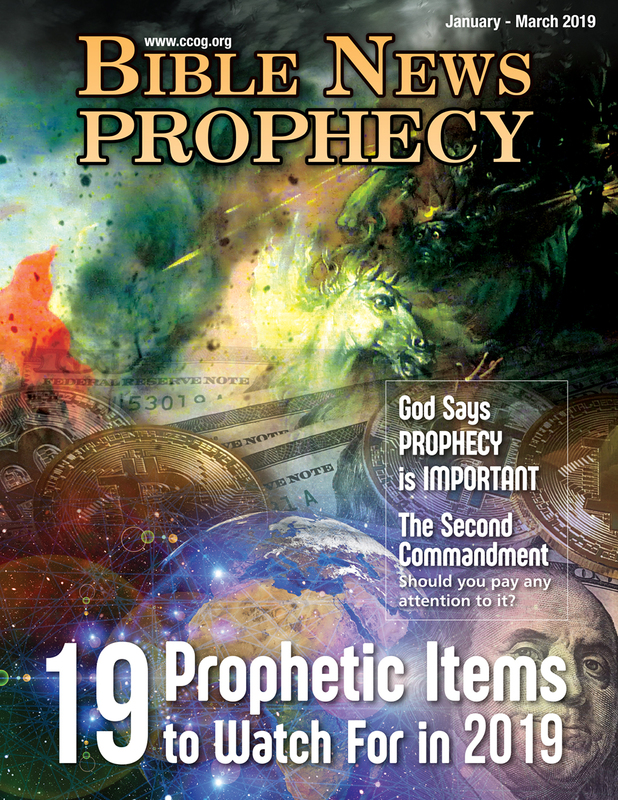 Here is a link to the January-March 2019 edition of Bible News Prophecy magazine. 19 Prophetic Items to Watch For in 2019 Many events will align with properly understood biblical prophecies in 2019. The Second Commandment Should you pay any attention to it? Study the Bible Course Lesson 14c What is Man? What are humans anyway? Are humans immortal or can they be granted immortality? Youth and Singles Q&A This article answers questions some teens and singles have wondered about. But when will the end come? When God determines that Matthew 24:14 has been fulfilled, and we of the Continuing Church of God continue to diligently work on this. Our latest sermon covered the 19 items; watch: 19 items to watch in 2019. 19 items to prophetically watch in 2019 Much is happening. Dr. Thiel points to 19, plus another, in this article. Here is a link to a related sermon: 19 items to watch in 2019. CCOG’s 6 Years and Scriptures Laodiceans Miss CCOG has the fruits Jesus talked about. But many onlookers have not properly understood various scriptures. CCOG 6 years: Philadelphians understand scriptures others miss. This entry was posted on Tuesday, January 1st, 2019 at 12:01 am	and is filed under COG News, Doctrine. What Did Jesus teach in the Gospel according to Mark?